Since 1997, TROPOS is conducting regular in situ aerosol particle measurements in the upper troposphere (UT) and lowermost stratosphere (LMS) using a passenger aircraft within the project "Civil Aircraft for Regular Investigation of the atmosphere Based on an Instrumentation Container" (CARIBIC, www.caribic-atmospheric.com). Overall objective of this project are near-global-scale measurements of trace gases and aerosol particles in the UT/LMS (here 8-12 km altitude). This atmospheric region is of particular scientific interest, because stratosphere-troposphere exchange (STE) processes play an important role for the distribution of trace gases and aerosol particles, and thus for the chemistry, the radiation budget, and the dynamics of the atmosphere. The CARIBIC data can serve to improve STE process understanding, as input and validation data for atmospheric and climate models, and to derive long-term trends of the UT/LMS aerosol. 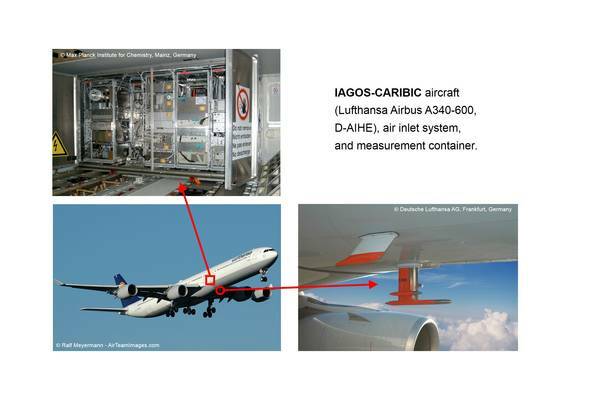 The CARIBIC infrastructure consists of the CARIBIC aircraft, a dedicated air inlet system, and the CARIBIC container, which houses the measurement devices. The CARIBIC aircraft is an Airbus A340-600 from the German Lufthansa AG, Frankfurt. The air inlet, developed by TROPOS, is mounted at the lower aircraft fuselage approximately 23 m behind the aircraft nose. The CARIBIC container is a modified air freight container of 1.5 x 3.2 x 1.6 m, 1.5 tons, and houses 17 measurements instruments. TROPOS is responsible for the three aerosol units in the container. Once per month the CARIBIC container is flown in the forward cargo bay of the A340-600 for two or four intercontinental flights. Besides the large space and payload capacity of a freight container its major advantage is the possibility of quick loading and unloading. This minimizes the disturbance of the aircraft routine operation and gives the possibility for instrument calibration and servicing. Since 2010, CARIBIC is part of the project "In-service Aircraft for a Global Observing System" (IAGOS, www.iagos.org). IAGOS is going to become a European Research Infrastructure with a long-term perspective. The figure below shows spatial distributions of the number concentration of particles larger than 12 nm in 8-12 km altitute in boreal summer, obtained on three different flight routes. 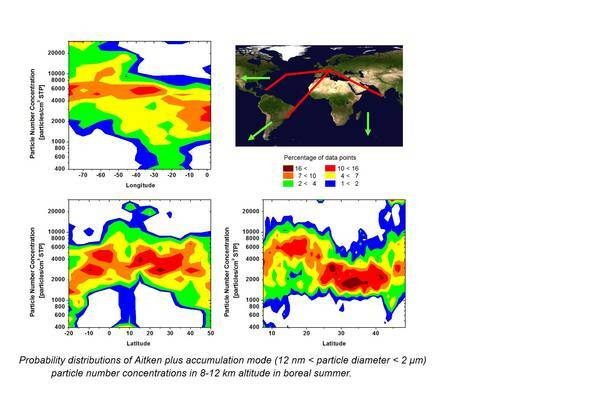 These kind of data are very important for validating global atmospheric aerosol models. We thank the Lufthansa AG for their financial and logistical support of CARIBIC. Without their willingness to support this, for a commercial airline quite unsual project, CARIBIC would not have been possible. The development of the CARIBIC system was and is financially supported by the Federal Ministry of Education and Research (BMBF) within the AFO2000 program and the IAGOS-D projects. The measurements benefited and benefit by the sponsorship of the European Comission within the 4th, 5th, 6th, and 7th research framework program, as well as by the German Research Foundation (DFG) within the SPP 1294.